The keel laying of the world’s first LNG hybrid barge took place at a ceremony held at the SAM Shipbuilding & Machinery shipyard in Komárno, Slovakia. 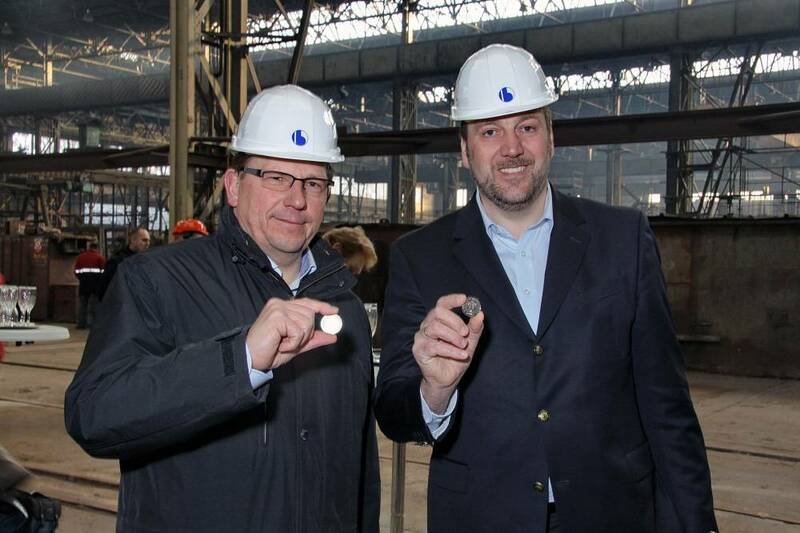 In the presence of representatives of the shipyard, AIDA Cruises, Becker Marine Systems and Hybrid Port Energy (a subsidiary of Becker Marine Systems and the barge shipping company), the laying of the keel was carried out following the tradition of placing a coin on the keel block prior to lowering the first section. The start of cooperation between Becker Marine Systems and AIDA Cruises preceded this keel-laying in the summer of 2012, with the aim of supplying environmentally friendly electricity to cruise ships during their layovers at port. The LNG hybrid barge currently under construction for this is equipped with five generators from Zeppelin Power Systems. These produce a total power of 7.5 MW (50/60 Hz) but with zero emissions of sulphur oxides and soot particles. The generators will be the first marine classified LNG Caterpillar engines to be delivered to customers. 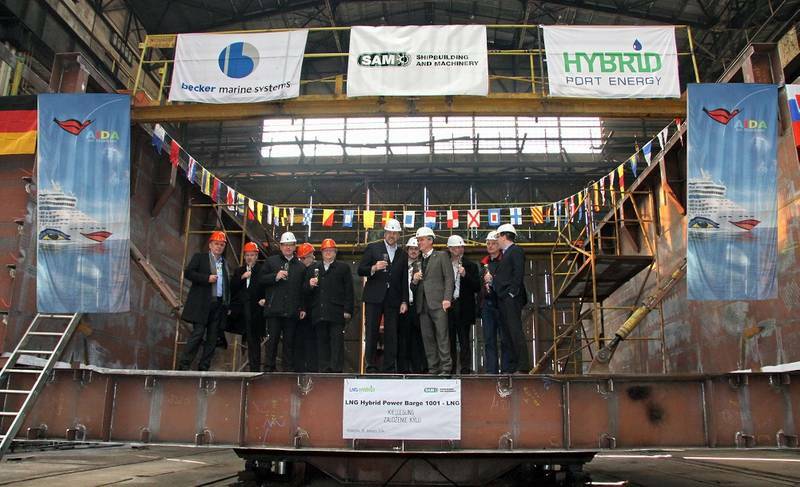 The LNG Hybrid Barge will be delivered in the summer of 2014 – just two years after the project began. The 74-meter long, 11.4-meter wide and approximately 1.7-meter draught barge will be stationed in Hamburg. The Port of Hamburg will thus be the first one in Europe to be offering an external, environmentally friendly and low-emission power supply for cruise ships. 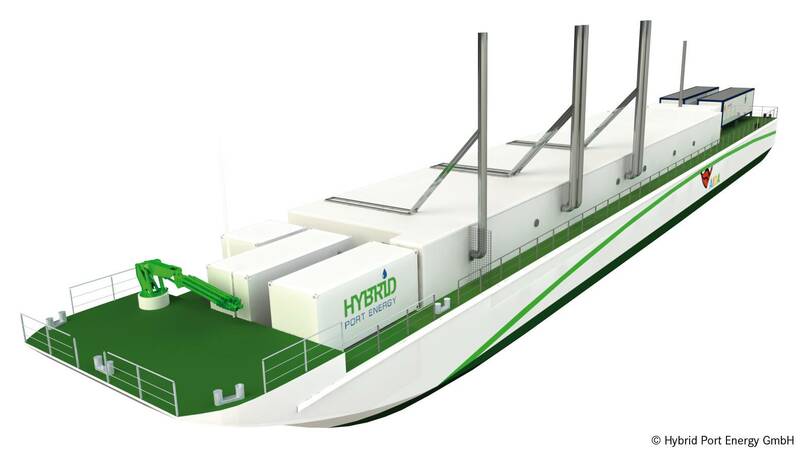 In addition, the LNG hybrid barge is equipped in such a way that other potential customers can be supplied with heat and electricity in the winter, thus further improving the barge’s ecological footprint.